How do you set your breakfast table for you and your kids? What is in everyone’s glass? It’s easy to eat better with balanced meals as well as serve up good nutrition for both you and your kids when everyone at the table has an 8-ounce glass of milk, too. There’s good reason to add milk to your menu. Dairy milk offers a range of health benefits, backed by decades of research. Studies repeatedly show the many benefits of having two to three servings of milk or milk products a day. The nutrients in milk help to build and maintain bone strength, and has been found to boost muscle growth and support healthy weight. The Dietary Guidelines for Americans explains how many people miss out on the four nutrients of “public health concern”: calcium, vitamin D, potassium and fiber. Many Americans are not consuming enough of these four nutrients and not getting enough is linked to health concerns. Milk provides three of these four essential nutrients — another reason to serve a glass at every meal. And that’s one way to eat better at mealtime. The Dietary Guidelines recommend adults have three servings of dairy products, like milk, every day, and kids should get between two and three servings. 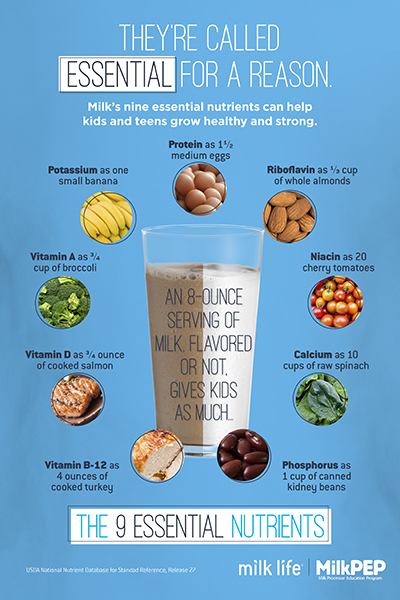 Flavored milk counts as a serving of dairy and provides the same nine essential nutrients. As reference, typical serving sizes are 8 fl oz milk, 1 large banana, 1 medium egg, 23 almonds, 5 cherry tomatoes, 3 cups raw spinach, ½ cup canned kidney beans, 3 oz cooked turkey, 3 oz cooked salmon and 1 cup raw broccoli.